Hamilton Island may not be not the obvious choice for hikers looking to experience the Whitsundays, because it’s almost synonymous with relaxation and the lay-by-the-pool-with-a-piña-colada island resort lifestyle. However, the Island holds an impressive variety of trails appropriate for those of moderate fitness and above. Much of the vegetation feels quite open by comparison to the dense canopy-covered forests of many Whitsunday islands, sending beautiful dappled light down through the trees. There is much less undergrowth and fewer climbing vines, giving walking on Hamilton Island a feeling of being in the Australian bush, but with palm trees. With less canopy comes less shade and so planning walks for early morning and packing plenty of water is highly advisable, especially in the summer months. Most trails have plenty of shady rest spots for a breather and gulp of water. The variety of trails on Hamilton Island is impressive, most leading to a choice destination like the secluded and aptly named Escape Beach where it was easy to forget you are on the busiest island in the Whitsundays, or a craggy peak with spellbinding views of around 50 of the 100 magic miles. Wildlife is also prevalent – you might come across various bird species such as orange-footed scrub fowl, kookaburras and cockatoos, sea eagles. Butterflies are also common in spring and summer months. You might even catch a glimpse of deer which act as a reminder of plans in the 1970s to establish a deer breeding program on the Island. We recommend the walks to South East Head and Passage Peak. During the last part of the walk to the head, the forest canopy gives way to grass trees and open vistas giving you a spectacular views south over Pentecost Island and the Lindeman Group. The trail to Passage Peak is a hard climb, but well worth it for the fantastic views in all directions, including glimpses of the white silica sands in Hill Inlet on the far side of Whitsunday Island. 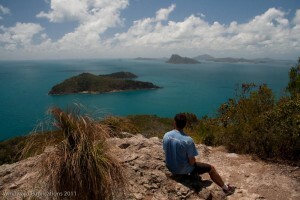 This must be among the best vistas of any Whitsunday walk. As good as Mt Oldfield on Lindeman, Mt Jeffreys on South Molle, and Whitsunday Peak on Whitsunday Island. These trails are a bit different to National Park walks, and not just because Hamilton Island isn’t a National Park. For starters they are a little more challenging, primarily because the initial Scenic Trail from the resort has quite a steep gradient, so whichever destination you are heading to, your walk will start with a upward stretch guaranteed to get your circulation moving. Most of the Islands trails have similarly steep sections, requiring some exertion to get up, and care to be taken to avoid slipping on the way down. These steep sections do mean that you reach the higher points faster than more gently gradients usually experienced on National Park trails. Quite quickly, you will start to catch more breezes and glimpses of the surrounding scenery, and there’s a sense of exhilaration to having a good workout in beautiful bushland with cracker lookouts. If you’re not in reasonable shape you might find the walks a bit of a challenge, as would younger children. But for everyone else who would like to soak up Hamilton Island’s natural side, these are some of the very best walks available in the Whitsundays and more conveniently located than most. Another upside to being outside a National Park is that you could always opt for the easy way to see some nature and grab hilltop views – quadbikes! Quadbikes would allow you to cover much of the island from the comfort of your sure-footed iron horse with a fraction of the time and sweat. So perhaps there’s something for the exercise-averse after all.